After doing an exhibition based on Old Route 99 that runs throughout California, Dennis Ziemienski has turned the numbers around and switched the focus out east by a state or two for his new Santa Fe exhibition, West Along the Mother Road, which features images from famed Route 66. Dennis Ziemienski, Fill'er Up? Oil on Canvas, 48" x 24"
The title of the show comes from John Steinbeck's classic novel, The Grapes of Wrath, it refers to the impact this legendary highway - which stretches from Chicago to Los Angeles - has had on American history and culture. "It runs right through Santa Fe and so I decided to concentrate on the part of the highway that runs from Texas to Los Angeles," says Ziemienski. "And, as far as history is concerned I like to look at the '30s, '40s and '50s for imagery." 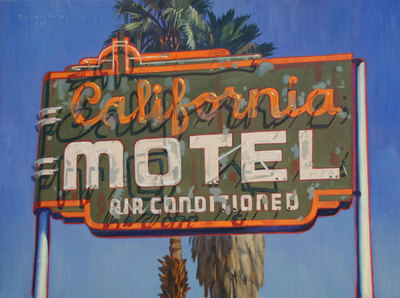 Dennis Ziemienski, California Motel Oil on Canvas, 36" x 48"
This time period is important to Ziemienski because it represents an America before chain hotels, restaurants and retail locations began dominating the landscape. It is a period when hotels were named Pine Cone or Navajo and the small motels competed to lure customers through extravagant neon signs and odd amenities. "Today's freeways avoid everything and just travel you on a straight line from point A to point B," explains Ziemienski. "Back then, these U.S. highways took you right through so many of these small towns - places like Barstow, Needles, Oatman, and Winslow - and that is where you would find all of the character and interesting architecture and signage." 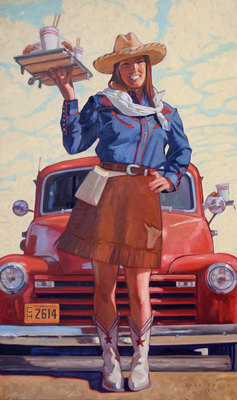 Dennis Ziemienski, Cowgirl Car Hop, Oil on Canvas, 60" x 36"
For Ziemienski, all of this relates to the joy of road trips and the sense of mystery that comes from not knowing what is literally around the next curve in the road. His paintings relate to a sense of innocence of the American past that finds its inspiration in everything that made small town America so endearing.